Trying to find pubs in Marsh Lane that are useyourlocal.com members? You’ve come to the right place. We’ve got every pub and bar in the UK listed. Whether you’re looking for a pub or bar to play darts, somewhere to play pool or just want to have a look at a menu before you go, we can help. 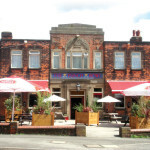 Here at The Punch Bowl, Gleadless we offer a warm welcome to all of our customers both new and old. We have recently undergone a massive refurbishment of which we are glad to host a great new environment for both friends and family alike.